I think it began a few days ago when I rearranged the apartment: the first foray into a season of change—a season that would begin a marriage. We felt a bit out of place, lost even. As freelancers, my fiancé and I were both finishing up major jobs, and our thoughts and conversations drifted often into the management of the everyday, the transition of things, the renovations of the apartment, our future work, our finances. We needed to stop. We needed to just feel “new.” We needed a beginning. I created a table space near our window—a place for us to sit, eat and work. The urban view of Manhattan’s buildings was so idyllic, quiet and close, it was as if a tromp l’oeil painting hung just beyond the glass. We sat side-by-side eating our breakfast of Spanish omelets and café mochas, which we pulled together with leftovers. At meal’s end, he leaned in to me, chuckling as if surprised and said, “I’m happy. I really am happy.” One can only recognize these moments as special, when life hasn’t always dealt you as such. 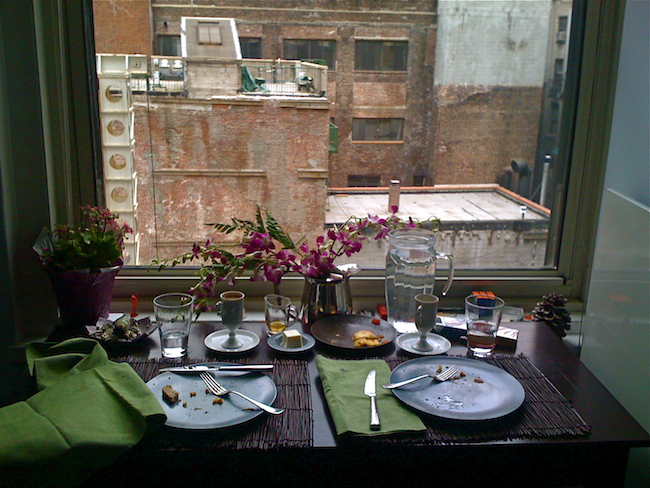 I took a photo of the window and the remains of the eaten breakfast. The light was soft, the time: non-existent. I relished the fleeting moment. New York, and the life within it, is not as quiet and romantic as the view from our window. Many years ago while visiting Manhattan, I had just spent ample hours at the Metropolitan Museum of Art. I was finally overtaken with exhaustion, and relented to more base needs, descending its grand steps and wandering eastward in search for something sweet. The day had been hot and my blue sneakers, loose white pants and a tank top seemed to absorb the heat from the concrete instead of easing me from it. I eventually stumbled into Nectar, a windowed diner, which I have not seen again until today, wandering once more from the Met, now a firm New Yorker myself. Previously, the waiter had not been happy with me. All smiles at first, he nearly threw the menu to the floor in disgust when I said I was just ordering dessert and a coffee. Yet he brought it to me all the same, and being a good southern girl, I tipped him anyway. Here now, the waitress is pleasant and affords me a table with a perfect view of the windowed room. I haven’t decided between the chocolate shake and the vanilla, but until my stomach chooses, I have coffee and a pen. contemplative figures quietly sitting by windows—writing, sketching, sewing and reading. Others focused solely on the view in which the window held—a picture within a picture. And lastly, some were odes to the personal rooms of the artists, a last souvenir just before moving on. Filled with light and silence, the paintings evoked a poetic realism rarely seen today outside of good cinema vérité. I had my answer. I confess now that my trip to the Met was also in search of answers to my own compulsion. I have, for many years, photographed windows and doors, even in the most painful and terrifying moments, where stopping to take a picture seemed ridiculous. I thought of the near hundred images of the like I had secretly sitting within my hard drive. Now a group of postmortem peers who shared my creative bent, pulled me into their quiet collective, telling me that this was only normal. I could hear a German-accented man, maybe the voice of Caspar David Friedrich, instructing me. “Yes. Yes. I see it now,” I whisper.